Being someone who travels quite a bit in state for work, it’s probably no surprise that I’ve been to Flint a few times recently. My jobs always take me there in the evening and by the time I get a dinner break around 11:00, most things are closed. There’s been a lot of Taco Bell and McDonalds meals recently just because they are the only ones open. I got sent to Flint for a long day last Sunday. I started in Kalamazoo at 2:00 AM and was packing up to leave Flint, to drive back to Grand Rapids then Kalamazoo at 7:00 PM. The only thing I was able to eat all day was a couple of McDonalds breakfast sandwiches at 5:30 AM. I had packed a few snacks knowing it was going to be a long day, but as I was starting the drive home, I knew I had to find something to eat before leaving town. As I was heading back to I-75, I knew my choices were pretty much fast food. 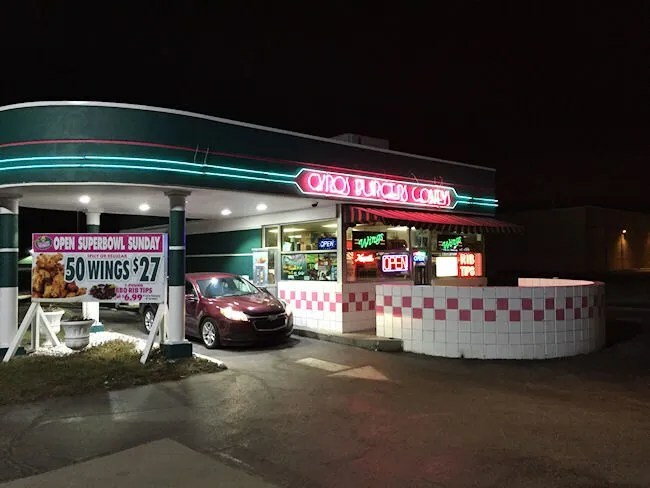 In addition to the Taco Bell and McDonalds I have been stopping at, there is a Halo Burger and a Ya-Ya’s that would still be open at this time of night. I was heading in the direction of Ya-Ya’s thinking chicken sounded good. I haven’t eaten at a Ya-Ya’s since we lived in Lansing although Halo Burger is always tempting. In the end, I made it to neither. Something else caught my eye. Why go to a chain? I guess I should always be looking for local flavor and as I was leaving Flint, I came across Papa’s Drive Thru. There was a sign out front for a special on chicken wings, so I took a hard left in to the parking lot. Papa’s Drive Thru is on the corner of Pierson and Jennings Roads in Mt. Morris Township just east of I-75. It’s a classic drive thru that has flares from the 50’s diner era. I have no idea how long this place has been here, but Papa’s has the look of a place that has been around for a while. The building is painted green and it’s wrapped in neon lights. 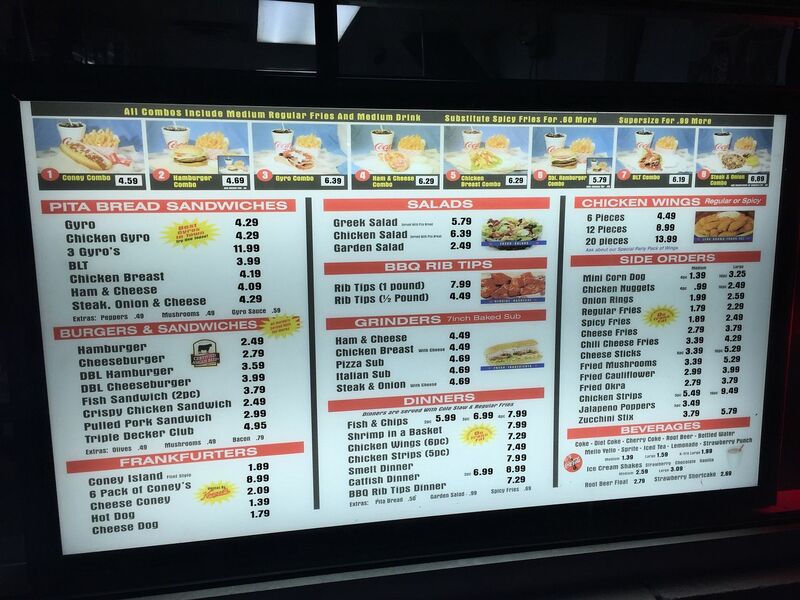 There is no dining room or even an “inside.” Your choices are drive thru window or there’s a walk up window in the front that is surrounded by a concrete wall with a pink and white checkerboard pattern adding to that 50’s diner look. The truck I was in was too big for the drive thru, so I had to park and get out in the bone chilling cold to order at the walk up window. There’s a large menu right up front and an employee saw me walking up, so he was ready when I got there. Turns out, I was lucky it was Super Bowl Sunday. 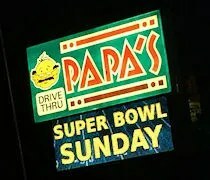 Papa’s is typically closed on Sunday, but they opened up to do a special on a large pack of wings. I actually wanted chicken, but 50 wings was way too many to eat by myself so I went with a somewhat more manageable 20 spicy wings and a large spicy fry. I bad the $15 dollar bill and started to head back to my truck. The employee told me it would only take a few minutes which I thought was odd for wings, but I trusted him and waited out in the cold. He was right. It only took a few minutes before I was handed a bag with my wings and a paper cup of fries. 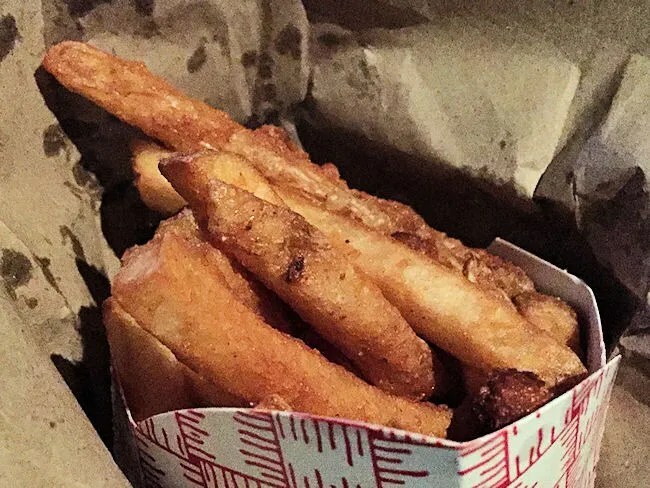 When I got in the truck, I started with the fries first. The cup fit perfectly into the cup holder. The fries were battered and the spicy part comes from a Cajun seasoning that is sprinkled on to them. They were a little soggy with no real crunch on the outside other than that from the batter. They were on the limp side although they were not raw. Still pretty good, but had the feeling of being reheated in the fryer instead of cooked fresh. The wings were kind of the same. I was already pretty surprised that they cooked in less than five minutes so my reheating theory comes in to play here. The wings were split wings pieces that were covered in a spicy breading and then fried. They had the appearance of breaded Buffalo wings and even had a little bit of heat to them. Like the fries, there was nothing crunchy. 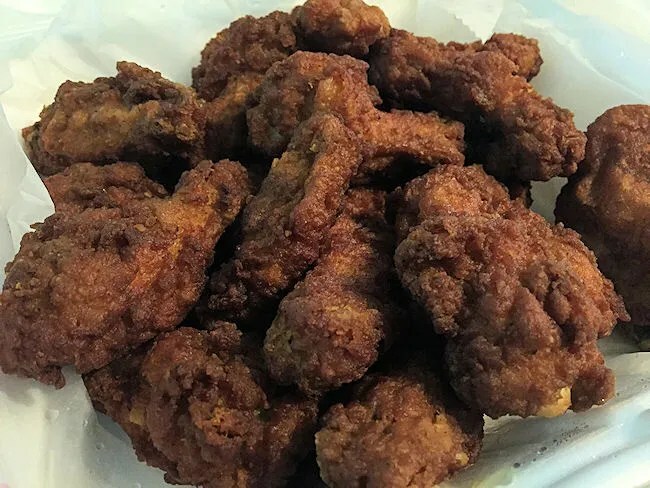 The wings were juicy and tender, but the breading was pretty soggy…not super greasy, but soggy. Papa’s Drive Thru has a lot of good reviews on the Internets all on things that I didn’t order or couldn’t eat in the car. I wasn’t super impressed with the wings, but I didn’t have a problem with them either. I was really hungry when I stopped at Papa’s for dinner so I really would have eaten almost anything. Based on the fried food alone, Papa’s was kind of a bust just because I felt like everything was limp and soggy. The taste was fine on all of it, the texture just left a little to be desired. I wouldn’t totally write this place off though as they have a reputation for Coney’s and Gyros.